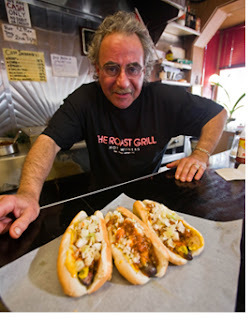 The Roast Grill, an iconic hot dog joint near downtown Raleigh for more than 70 years, offers a one-of-a-kind culinary experience. Where else will you find seating for only 12 people and possibly dine next to a lawyer, doctor, senator or even a former governor? Owner George Poniros, who took over the family restaurant from his grandmother almost 20 years ago, mans the eatery’s two-knobbed original grill. It’s there that he cooks each hot dog until charred black. “Our motto is ‘we burn ’em for you!’” he told me at lunchtime not long ago. Hot dogs are $2.50 each. Toppings include Sauer’s brand mustard, mayonnaise-free slaw (which costs an additional 25 cents), Texas sweet onions and a century-old family recipe house-made chili. Ketchup is nowhere to be found, though. In fact, there’s a “no-ketchup-allowed” policy that’s been in place as long as the restaurant has been open for business. George said his grandparents spent too much time making the delicious chili for people to ruin it with ketchup. George’s mother, Freeda, works alongside him and usually takes orders, delivers food and drinks to customers and tends the still-operational antique cash register. She also makes sinfully good homemade baklava and pound cake, served saran-wrapped in individual portions. The Roast Grill is a cash-only establishment open from 11 a.m. until 4 p.m. Monday through Saturday. Go early if you want to avoid waiting in line.